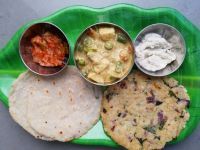 Rotis made of Bajra/Kambu are popular in Gujarat and Rajasthan and Jowar/Cholam Rotis are popular in Karnataka and Maharashtra. It needs an expertise to make soft millet rotis by patting with hands. But Autolysis technique simplifies the process and the dough becomes pliable. We can easily roll them into rotis and autolysis eliminates the patting process! In a 2 Ltr Pressure Cooker add water, salt and oil. Cover and cook for a whistle . Switch off. Carefully release the pressure and open the lid. Add flour and mix thoroughly till it resembles like wet sand. Keep it closed with weight on for 15 minutes. Open and knead briefly. Divide the dough in 6 equal parts. Roll them into rotis by dusting with dry flour. Cook on a pan on both sides. It fluffs up automatically like phulka. Generally millet flour absorbs water in the ratio of 1 : 1. But it may differer with different brands of flour. To ascertain the exact quantity, first make dough with hot water manually. Measure the water and note down. From next time onwards, use the same quantity for autolysis. The procedure is same for jowar and other millet flour rotis. For beginners one important and easy tip to get perfect round shape: After rolling punch out circles with a dabba lid. This works really well! 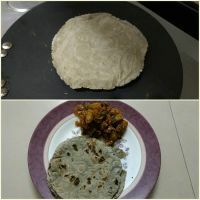 I have been making jowar and bajri roti using the autolysis technique. I sometime roll it or sometimes use the roti press to make them. But I have noticed that they shrink in size as soon as I put them on the tawa. Has that been your expreience too? I’ve never come across this. It remains the same for me. Tried this roti yesterday as I have been wanting to make soft millet rotis for long..the roti was soft , however it kept breaking while trying to take from roller to tawa..Also it didn’t fluff up..I used 3/4th water for 1cup maavu as my flour doesn’t take more..
Was your water qty perfect? Even a tbsp of more/less water makes a difference. First arrive at the right water qty by manually mixing with hot water as suggested in the post. Dust liberally and don’t press too hard while rolling. Even if the shape is nor perfect, just punch with a steel dabba lid. Use an iron tawa for making roti. Cook the bottom side fully before flipping. Hope all these tips will help you get perfect millet rotis. Didn’t wanna give up on millet rotis and tried making with Jowar today..my flour absorbed lil more than 1cup for 1.25 water..and tried rolling with the tips u gave..it did break while taking off the roller and carefully did with steel dosai karandi.. though it didn’t fluff up like yours it looks definitely better than last attempt..and maybe it didn’t fluff up as I couldn’t roll it thin like wheat roti..
With practice you’ll definitely get excellent millet phulkas. For dusting use wheat flour or rice flour as millet flour tends to stick to the dough. Dust liberally and while rolling don’t give pressure as you do for wheat flour. If you keep all these points in mind, you’ll get excellent rotis. I am follower of opos and your blog from couple of months. Your recepies are amazing maam. I feel pressing roti in metal presser is easy task than rolling. Now in market we get silicon roti sheets, we can use that sheet on bottom and normal plastic sheet on top. Both sheets should be smeared with oil. 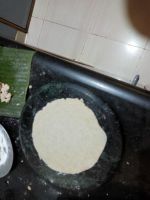 After pressing roti, top cover to be reoved and roti can be placed on tava along with silicon sheet and once roti starts cooking the sheats leaves the roti automatically. less mess and easy task. Actually I am very small in front of you, but wanted to share my experiance madam. Keep going on with amazing recepies as usual madam. With autolysis technique, it’s very easy to roll and many have started making millet phulkas following this method. If you arrive at the right proportion of water to your millet flour, then it is a child’s play! At the same time, if you are comfortable with pressing and making rotis, please continue your method. Thanks so much for sharing your experience and your motivating words. Nobody is an authority in cooking and we all learn from each other. Feel free to share your thoughts. Once again thanks so much. Hi vijaya today made bajra roti using this method. It was fantastic, although it didnt puff like yours was very very soft and melted in mouth. One doubt should these rotis be cooked in high flame or low flame to puff? I suggest you use an iron tawa and flip only when the bottom side is completely cooked. Cook on medium heat once the tawa is hot. After flipping, wait for 30 seconds and then press with a spatula so that it puffs up. I’m sure, by practice you’ll be able to make perfect millet rotis. Thanks so much for the validation and sharing your experience. 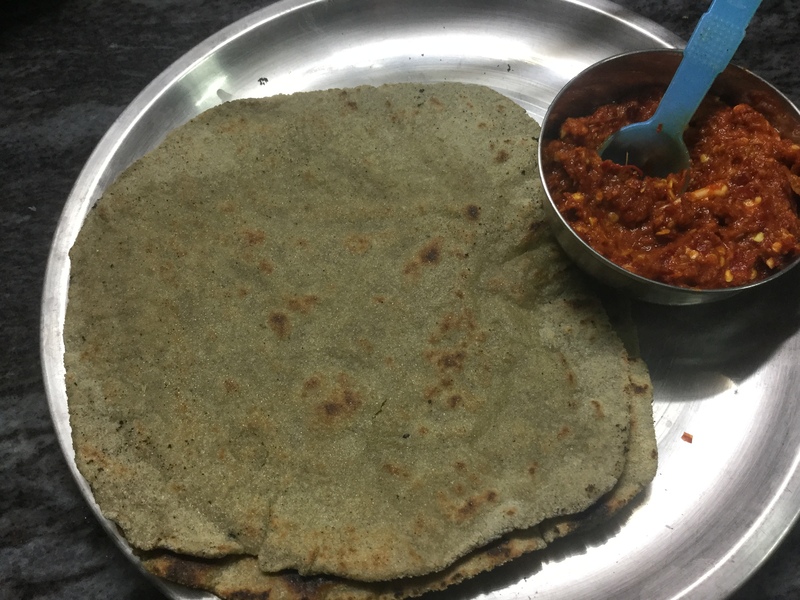 Thanks so much for trying this recipe and I am happy to know that you are satisfied with your millet rotis. Please share a few pictures whenever you get time. It needs some practice to get a grip of millet rotis. Use an iron tawa for making rotis and allow the first side to cook well before you flip. This helps in fluffing up. Thanks for sharing your experience. Hello! Tried jowar idiyappam yesterday. Motivated by the success tried jowar roti.. but I couldn’t roll it as it was breaking. I think I would have to increase the water content a little. Planning to try it soon and will update. I used 24 Mantra organic Jowar flour for both roti and idiyappam. Idiyappam came out perfect. Thank you so much for the wonderful recipies. I was checking your website for ragi/Bajra/Fowar Koozh. My dad used to love them so much. Would be lovely if you could share recipies for the same. Hi Sasi, sorry for my late response. I also use 24 Mantra brand. It takes 1cup plus 2 tbsp of water for a cup of flour. Happy to know that you tried again and succeeded. Happy for you! Made varagu flour pathiris! Super soft rotis 🙂 Thanks VV mam! I tried this recipe and the rotis come out soft and remain that way throughout the day.Thank you for sharing. I have a concern though.if we use boiling water,arent we destroying most of the nutrients?? Does the method work if you boil water in a regular pan, add flour, cover and keep? Simply asking if we can make the dough without using a pressure cooker? Also, should the rotis be rolled out as soon as dough is ready, or can it be kept like wheat dough? Can it be made before hand and stored in the fridge? Using a pressure cooker helps in autolyzing the dough well. The heat is retained inside the cooker and the dough becomes soft which helps us in rolling out the rotis easily. I suggest you make rotis with the dough prepared within 2 to 3 hours. Millets don’t contain gluten and so they are not suitable for keeping in the fridge for later use. Hi Vijaya, Thanks to your recipe ! Everytime I get such soft millet rotis.. my family loves it ???????? Thanks for validating his recipe. Yes, autolysis is a boon for millets and soft rotis are possible only because of that! Happy to know that your family loves millet rotis. Hello Vijaya, did you use fresh ground flour for this roti or store bought? Will it make a difference? Thanks! I have tried with both. The water quantity may vary, but the result will be same. Thanks for your visit. 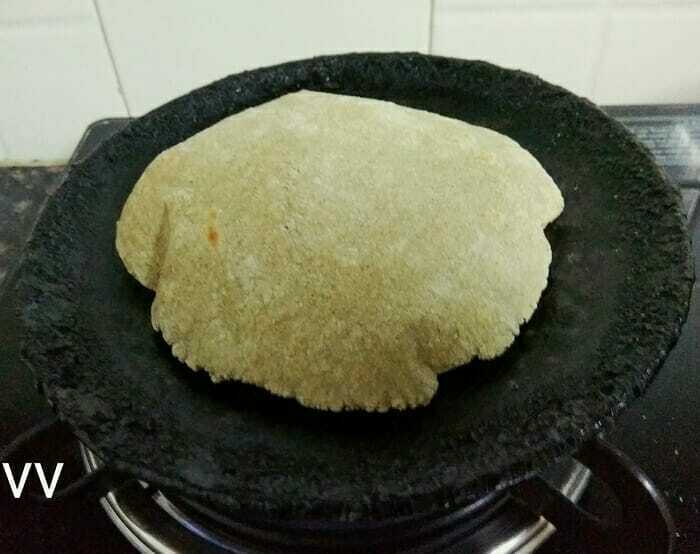 Hello Vijaya, I tried making Jowar roti using the autolysis method, but I wasn’t able to roll it too well, as it kept sticking and cracking up as I tried removing them. What should be the consistency of the dough? Or is there something that I am missing. Also wanted to tell you that I love your collection of millet recipes. I have tried the tahari, it was really nice. Thank you! The water proportion is the most important thing for getting perfect rotis. Each flour needs different quantity of water. If the dough is sticking means, the water was more. So next time use 3/4 water for a cup of flour and see. Thanks so much for trying tahiri and if possible please leave a comment in that post. Wish to see your jowar roti soon! Thank you so much Harsha Sanghrajka and Vijaya Venkatesh for helping with the Bajra roti recipe. I made it today and it was success. It was an achievement. I have been wanting to learn since the time I saw a north Indian Friend but haven’t been able to. This was a dream come true for me. Happy to know that you succeeded in making millet roti! Autolysis is a boon for millets and no more messy hard millet rotis. Thanks for trying and sharing your experience. Hi!! I interchanged the ratios of water and millet flour and couldn’t form a dough. Silly me! 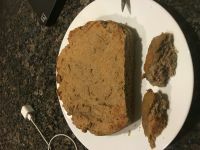 Tried dusting off with whole wheat flour and set aside for an hour hoping it would dry but no luck. I cannot waste food but didn’t want to make 3x roties so I tossed it into oven for 30 mins and it turned out to be amazing bread. As crunchy as Italian bread yet dense as rye bread since I didn’t add any yeast or baking power. Had it with thecha and it was amazing! Cannot wait to try roties next! The measurement cannot go wrong because the ratio is 1:1. So interchanging is not possible! I feel, your flour requires less water. Next time try 3/4th cup of water for a cup of flour. That should fix your problem. Now I am tempted to try bread with the autolysis flour. Btw, your bread looks good even without yeast. Thanks for trying and sharing your bread idea! Looking forward to your roti post soon! Sorry for late reply! I used wheat ratio and switched that (1:3) but then I tried the correct recipie and it was fabulous! Made it several times now and it really eliminates the need to knead. Thanks so much!!!! Happy to know that your rotis are turning out fabulous!! Autolysis is a wonderful technique which eliminates kneading the dough. Dear Vijaya, I have 2 jowar rotis daily and the autolysis method is what i do. makes my roti nice and soft. But my rotis do not fluff up. I normally use high gas when roasting the jowar rotis. Cud that be the reason? when i roast one side first it roasts well, but the second turn the rotis have cracks. I do not know what i am going wrong. Please advise me. Sorry for my late response. I was busy with guests and hence could not reply immediately. Use iron tawa or mud tawa for millet rotis. They help in spreading the heat properly. Cook one side till you notice small dark spots. Then flip the roti and cook on the tawa itselt. No need to cook on the flame. Use medium heat for the first side and high heat on the other side. The rotis will fluff up beautifully. Would like to share this as jowar roti is our staple food .. as soon as you put the roti on tawa apply water on top of it with cotton cloth… when water starts evaporate flip it.. try this let me know how it turns out.. Thanks for trying and validating the recipe. Even I was making hard rotis which I never enjoyed. But with autolysis, started liking the millet rotis and make them often. 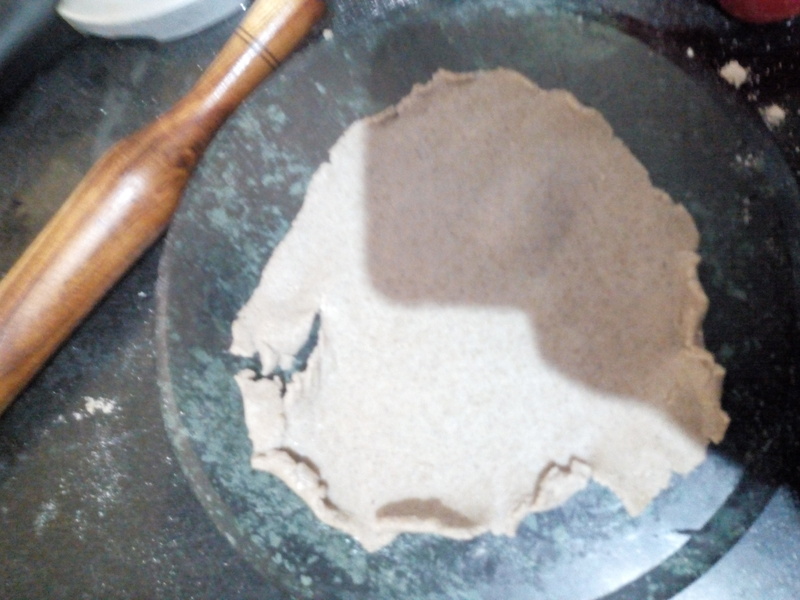 The Millet Rotis are one of the toughest to make without proper method. When I made these Jowar Rotis without proper measurements and method before an year ago; the rotis turned out so hard like a hard stone. Today it was like an exam and I cracked it with wonderful aroma and soft Jowar Rotis. Many thanks to you ma’m, you have given a wonderful fool proof method for Millet Rotis. I also went through the same phase as yours before cracking the perfect fool proof method for millet roti! But autolysis made all the difference and now we are enjoying soft millet rotis. Happy to share this recipe with all of you! I have been using opos method for all my cooking now. Your method of autolysis to prepare the millet rotis is phenomenal and fail proof. I love millet and millet roti. I don’t normally attempt it as I am never sure of results. Having food on table is a big challenge thanks to my clingy toddler and Pregnancy and living abroad. After trying your method today I felt very happy because it was very soft, well cooked, rotis tasting like it should and toddler loving it too. At the same time everyyhing was done in same vessel. I am hoping to find more millet flours here so I can make the rotis more often. My sincere thanks to you.. I tried jowar roti today. Thanks for trying and validating the recipe. Please try other recipes and share your experience. What is the purpose of pressure cooking water instead of using it directly? Which brand flour did you use? I will be able to roll this chapatis instead of pressing with hands? Hi. I would suggest you try it out first. It’s really fail proof. You can roll them which is what is amazing in this method. My tip is using a baking paper on your board for easy rolling. Please go through the autolysis column fully. This technique is very useful for making the non gluten millet flours to pilable consistency so that we can easily make rotis. I use 24 manthra organic variety. Please try once and see the difference. Have a doubt. While making dough for rotis or dumplings, you had told to add the flour to the boiled water in the cooker and then leave for 20 mins with closed lid and whistle on. Do the stove also be on during that time in sim ? In the direction section, I have clearly mentioned to switch off the heatafter first whistle. Do not open the cooker when the fire is on. Switch off, release pressure carefully and then proceed. No need to keep the heat on. The flour gets cooked in the retained heat . Okay. Thanks much. Will try. Extremely helpful for people like me having millet diet. We have lot of varieties to try. Keep going and all the best. Autolysis method of kneading the dough has simplified our job to such an extent that we can choose to make such rotis even during working days. Of course the rotis remains soft through out the day. It is amazing that you have explored this method to all the entire family of millets. I have tried it with jowar and bajra. Gives softer rotis all the time. Thanks a ton VV. Your rotis looks really awesome! Happy that the tedious process of kneading and patting millet rotis was simplified by RK. I feel very happy to see the puffed up rotis. Thanks for trying and validating each and every recipe. Yest I made the roti using kambu mavu. It was so soft and yummy. Thank u mam and also rk sir who shared ur page in a fb grp. I made the roti with kambu mavu.. it was so soft and yummy. Thanks to u mam and rk sir who shared ur link in fb grp. Thanks for trying and I am happy that you got good results. Welcome to Millet world! Hi! I tried the kambu Roti’s. Used the 1:1 ratio. Could not roll them using rolling pin. Had to pay them by hand. So they didn’t fluff up. What have I missed? Hi Anitha, I have clearly mentioned that first time do manually to know the water requirement for your flour. Each flour needs different proportion of water. If you find your dough hard, then add a few table spoons of warm water, knead and proceed. Hope this helps you. Lovely!I will try one by one and give you the feed back.Thank you for sharing your millet recipe. Hello my namesake! Please try and give your feed back. Welcome to Millet world!